With millions of blogs in the world — the blog search engine Technorati tracks more than 1 million blogs — it’s obvious that blogging is a popular and successful format for publishing a website. But just what are people doing with blogs? They can’t all be talking about their cats! And they aren’t. Bloggers are using the blog format to communicate effectively in all kinds of information spheres, from the personal to the professional. In fact, many blogs serve multiple purposes at the same time, mixing posts about activities at home with news pertaining to work. Your blog can serve many purposes in your life. A lot of folks use blogs for the same reason they might keep a diary — to chronicle their lives and activities. This urge to communicate appears in all kinds of mediums, from scrapbooking to taking digital photographs. If you’re interested in sharing personal details with others, a blog gives you a fast, efficient way to do so. If you send holiday newsletters every year or e-mail a group of friends and family to let them know about exciting events in your life, you can have a lot of fun with a blog. You can blog as often as you want, and your readers visit when they’re ready to get more information. Best of all, each blog post gives your friends and family a quick way to respond to you; they have only to leave a comment on your blog post. You might find you’re talking more with your family than ever before! “. . . 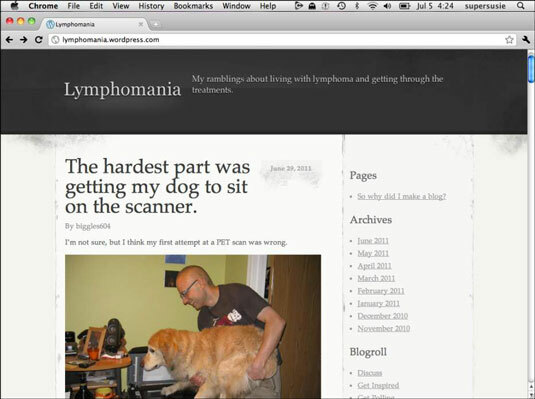 I have lymphoma, and as scary as it’s been, it’s also been a great learning experience; learning how amazing the people around me are, how I can handle such a life-changing event, and learning about the disease and the treatment. In your eagerness to let your friends know about what you’re up to, don’t forget that anyone in the world can access a blog (unlike a real diary or scrapbook), now and in the future. Don’t publish anything that you might find embarrassing in the future, and have the same consideration when you talk about others or use photographs. If you have a passion or hobby that you just love to talk about, consider doing so in a blog. Anyone who shares your interest is a potential reader and is bound to be looking for more information wherever he or she can find it. You can detail your own experiences, offer advice to others, drum up support for whatever you like to do, or just talk about what you love. Best of all, you might be able to make connections with others who share your infatuation, making friends and finding ways to get involved with your hobby more deeply. Cybele May runs a blog about something she loves: candy. Candy Blog is her personal labor of love and a great excuse to buy a lot of candy! Cybele reviews candies, writing extensive descriptions of taste, texture, and ingredients for fellow sugar enthusiasts. And they respond! Nearly every review garners comments from fans and critics of the candies that Cybele samples. Sometimes, a blog is all about sharing information. Journalists use blogs to report on local, national, and international news; critics and commentators use the medium to state their opinions and predictions; educators keep parents and students abreast of classroom happenings and dates; coworkers let colleagues in geographically distant offices know what’s going on in relation to collaborative projects. The uses of the informational blog are really limitless. 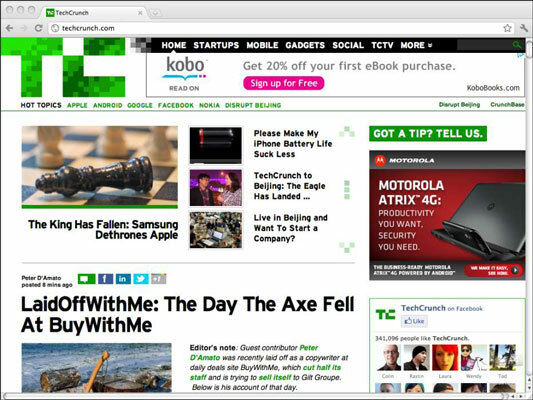 One popular information blog is TechCrunch. This guide to everything Internet covers everything from new companies to the latest geek gadgets and, of course, offers a lot of information about software. You might not find every post useful, but if you’re trying to keep up with the breakneck pace of technological innovation on the Internet, you may find TechCrunch and blogs like it invaluable resources. 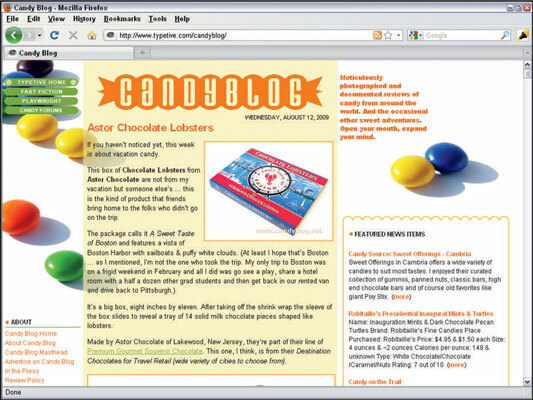 The most common technique involves including advertisements on your blog pages. For example, Google AdSense provides in-page advertising that’s designed to match the content of your blog and therefore be of interest to your readers. Each time a visitor to your blog clicks one of these advertising links, you earn money from Google. In many cases, use of the informal voice of the blog medium has helped customers understand that real people work in these organizations. This personal connection improves a company’s credibility and often enhances customer recognition of its brand and values. Southwest tries to make sure that the blog represents many voices inside the company, from managers to captains — even the president of the company. As with personal blogs, the tone is light and conversational, making the company seem friendly and accessible.